The Gippsland Branch of the GSDCV was disappointed to hear of an illegal puppy farm that was operating in our home town and that nearly 40 dogs had to be seized and placed in the care of Animal Aid. 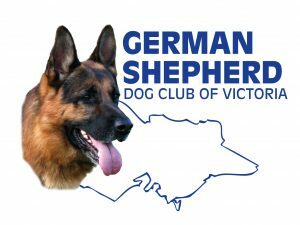 Although the dogs were not German Shepherds, our members are very passionate about the welfare of all dogs regardless of the breed. When Animal Aid put our a call for donations to help feed the unexpected influx of dogs our Branch Manager Ray together with club President Tony Mercieca contacted our clubs long time sponsor Royal Canin to see if we could help. 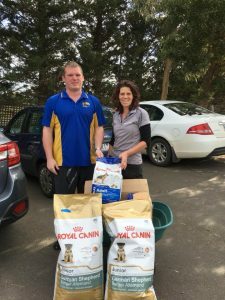 In a joint effort between Royal Canin and the Gippsland Branch we were able to donate over 40kgs of quality Royal Canin dog food to the local Animal Aid shelter to help with feeding all the dogs currently in their care. Pictured is GSDCV Gippsland Branch Manager Ray Batchelor with Animal Aid volunteer Michelle.